Having read a number of excellent articles written by the authors of Dissolving Illusions, we knew in our bones this was going to be a good book. But even our eager anticipation didn’t prepare us for the riveting read it turned out to be. The historical and scientific research presented by the authors takes us back to the root causes of disease, making the clear connection between the deplorable living conditions of the 1800s and the resultant epidemics of disease. 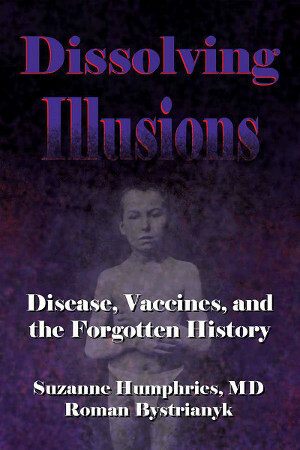 Dissolving Illusions is a powerful tool for everyone seeking to dispel the prevailing medical myth that vaccination is what saved us from the brutal cycles of disease epidemics. The book provides powerful ammunition to counter the glib propaganda spun by leading vaccine apologists like Paul Offit who say, "I think you could argue that vaccines are the safest, best-tested things we could put in our bodies." In our early years as alternative health activists, we turned to the work of medical historians such as Thomas B. McKeown (The Role of Medicine), Rene Dubos (Mirage of Health), Ivan Illich (Medical Nemesis), and John and Sonja McKinlay (The Questionable Contribution of Medical Measures on the Decline in Mortality in the Twentieth Century) to provide us with a road map of where we have come from and what we need to know to create health. In order to stand strong in our own health philosophy of living in harmony with nature, we both knew the importance of understanding the real history of infectious diseases - the social, economic and environmental factors that fueled the plagues and epidemics of the past. From these stellar investigators, we learned that it was radical improvements in living conditions that extinguished yesteryears epidemics. When people were lifted out of desperation, poverty and squalor, were given access to clean water supplies, sewage systems, upgraded housing and, most importantly, enhanced nutrition, the improvement in overall health and resistance to disease followed as surely as day follows night. They uncover the work of past investigators who viewed these measures as a misguided diversion of resources away from more important environmentally focused health programs. In chapter 8, The Power of the State, we learn that eugenicists used the compulsory smallpox vaccination laws to justify their cause to sterilize “imbeciles’ in order to protect the ‘public’ and improve the human race; individual rights be damned. In Chapters 10 and 11, we learn about how the “health revolution” brought much needed sanitary reforms which coincided with a sharp decline in infectious diseases, some that had no associated vaccine, such as scarlet fever. In Chapter 12, The Disappearance of Polio, the authors shine in documenting the real causes of the polio epidemics of the 1950s – agrichemicals coupled with ‘aresenic-derived’ medications and diets high in refined sugar. In Chapters 13 and 14, we learn about the history of whooping cough and measles and how their fatality rate plummeted prior to the introduction of a vaccine. But more than that, the authors reveal from medical journal sources known immune system complications such as ‘rashless measles’ triggered by the vaccine, malnutrition, formula-feeding and giving immune serum globulin when maternal antibodies are present in the infant. In Chapters 15-16, we learn about suppressed natural remedies and the importance of vitamin C as an essential metabolite in the prevention and treatment of infectious diseases. In the final chapter, Belief and Fear, the authors shred claims in Paul Offitt’s book, Deadly Choices, through historical documentation that he conveniently left out. We also learn of the multitude of bizarre 20th century licensed vaccines that most of us have never heard of. It has long been my contention that those who question the science, safety, and recommendations around vaccination are the most learned on the subject. My colleagues, particularly MDs, who have come to a place of concern, frustration, and determination around reform of this practice have spent tireless hours educating themselves on everything there is to be known about these mandated pharmaceutical products. Far from being uneducated, defiant, and dangerous, vaccine dissenters understand immunology, natural history of disease, and the true requirements for the practice of safe and informed medicine. Dr. Humphries and Mr. Bystrianyk have assembled an awe-inspiringly thorough and comprehensive text that supports, with primary evidence, the inefficacy and danger of the most commonly treasured vaccines. It is impossible for me to imagine that a dedicated reader could turn the last page of this book and not feel that the lights had finally been turned on. Do not step into an injecting physicians office without doing this homework. This is information your doctor never had access to and likely never will.